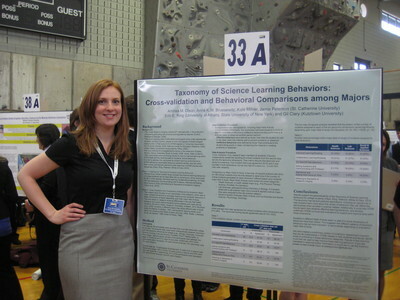 "Taxonomy of Science Learning Behaviors: Cross Validation and Behavioral Comparisons among Majors" by Anna Bruesewitz '11 and Jamie Peterson Ph.D. This research study focused on behaviors that college students perform when they are learning in the sciences. The collaborators examine the full range of behaviors that are relevant to learning in the sciences and that are within a student’s control. This study is funded by a Large-scale 3M Collaborative Student-Faculty Research Grant. “I never would have thought I liked research and now I really do,” says Anna Bruesewitz ‘11. No one is more surprised at her newfound interest than Bruesewitz is. Her enthusiasm for research was sparked after working on a project with Andrea Olson, department chair of psychology, Jamie Peterson, assistant professor of psychology and Kate Milner ’10. Their research explored how college students study and learn in the disciplines of science, technology, engineering and math. Prior to Bruesewitz joining the research team, the project was previously worked on by former professor Gil Glary, Erin Ring ’09 and Rachel Dauner ’09.